The remote API may return data in a undeseriable format, like XML. The remote API may return data you don’t need, resulting in a slower response that includes data you won’t ever use. The remote API may work with data that doesn’t need updating often. Your server can then add it’s own caching layer. The remote API may go down. By having your own entry point, you could handle this in multiple ways, with either static data or some other result that won’t completely break the clients. Finally, the remote API may get bought by some large company (perhaps one that rhymes with MaceLook) and be shut down. You could replace the remote API completely and your clients will never know. 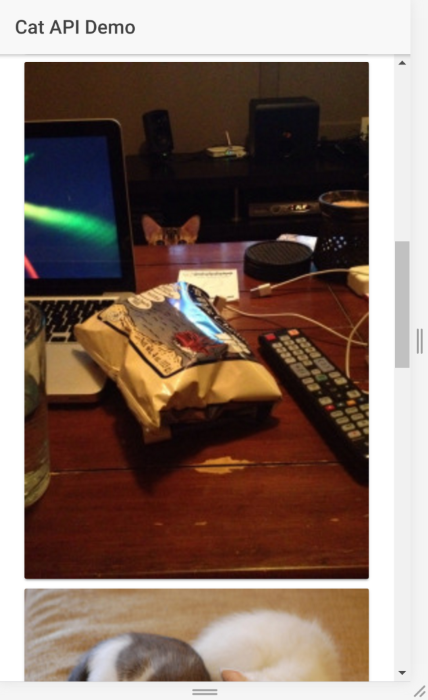 For my API, I decided to use the Cat API. The Cat API returns random pictures of cats. 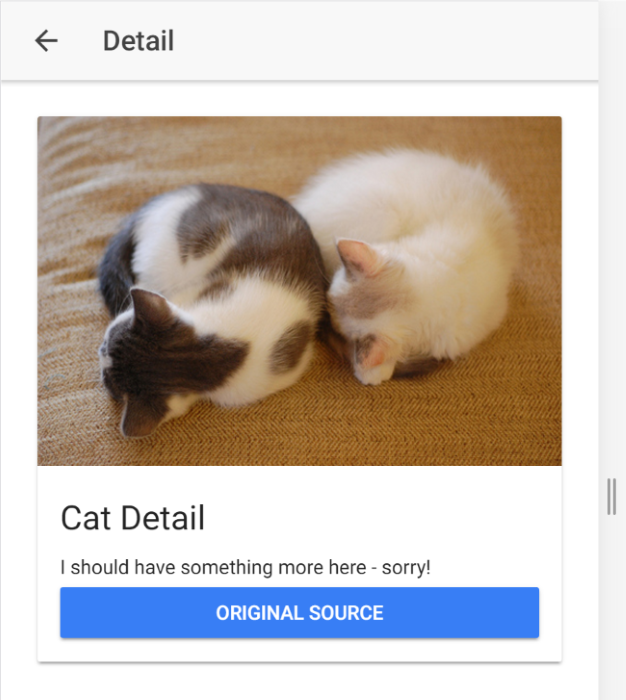 It lets you filter by categories, vote on cats, and more. While it doesn’t require an API key, but if you don’t pass one, you are limited to a set of only 1000 cats, which as we all know is far too few. Also, it returns XML. Which is gross, but I’ll forgive them anyway since we’re still talking about cats here. I’m going to assume you read my earlier post, but just in case you didn’t, here is a quick overview of how OpenWhisk works. 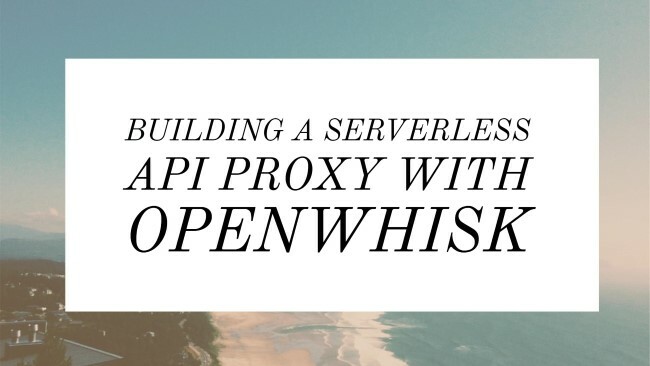 You download a command line program (technically this is optional), write your action (a program that does one thing), and then deploy it to OpenWhisk. The final step is to expose the action via a REST API. Nice and simple, right? The first action will return a list of 10 random cats. It will return image URLs in a small format approrpiate for a list. The second action will return details for one image and ask for a larger image URL. To be clear, you’re seeing the complete result of the action (well, as much as I could fit in the screenshot), which includes metadata about the action call and the result itself. What will be used by our clients though is within the response.result section. This one is even simpler as we just need to massage the result of one item. Note how I access an expected parameter for the ID: params.id. And honestly, that’s it. One issue you may see is that I’ve got one API key in two separate files. I could correct this by switching my code into a package (see the docs), but that felt like overkill for this particular demo. It would definitely be the right path to take though if I started added more actions related to this one particular API. The last step was to expose this via a REST API. As a reminder, this is still a work in progress, so you probably don’t want to do this yet for real code, but it works great already. The general process with the CLI has you define a root API path, a particular path for this call, the HTTP method, and finally the action to call. 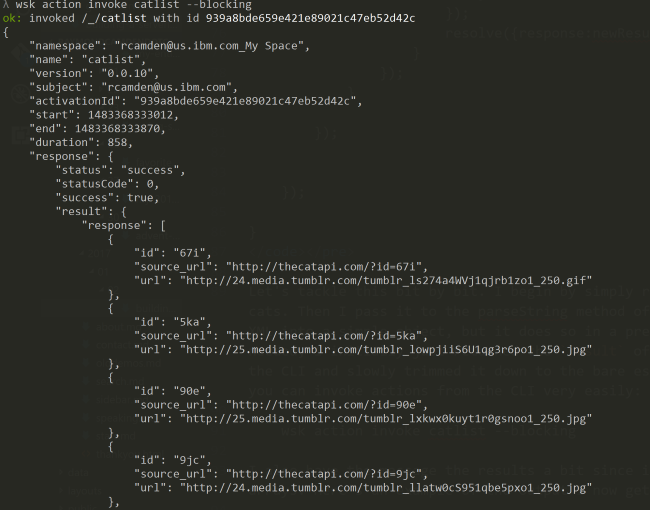 And the detail - that button loads the detail page on the Cat API site. Generated class for the CatProvider provider. So yeah, nothing special here, nothing unusual, which is exactly what we want! Our Ionic app speaks to our OpenWhisk implementation and the actual API is completely hidden from the user. (Err, ok technically not - since the detail page opens up on the site, but you get the point.) There’s no API key. No XML parsing. That’s all hidden behind the scenes. And even better, I didn’t have to write or setup my own NodeJS server. All I did was write two small actions and deploy them and I was done. If you can’t tell yet - I freaking love this!